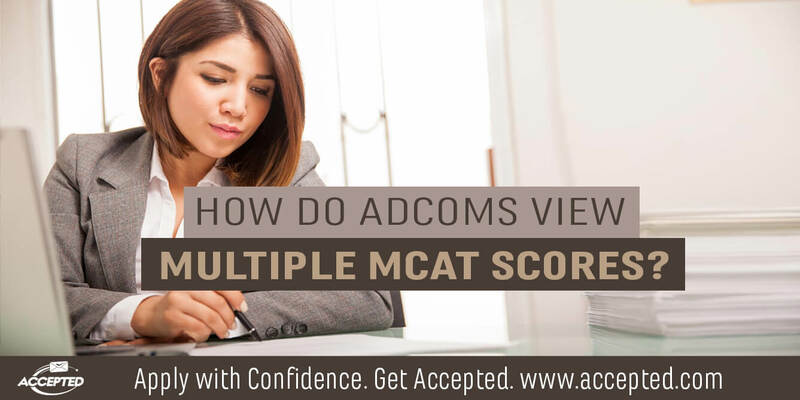 How Does the Med School Adcom View Multiple MCAT Scores? In 2007, the MCAT was first offered electronically. Prior to this technological shift, the MCAT was only offered a limited number of times a year – as a paper and pencil exam. There was also a restriction placed on the number of times you could take the exam in one year as well as in your lifetime. Now that the MCAT is offered 17 times, just this year alone, and there are limitations placed on the number of times that you can take the exam in a calendar year or in your lifetime (three times in a single year, four times in two years, and seven times lifetime), many students take the exam more than once before applying to medical school. The way that these scores are viewed by admissions committees can cause a lot of anxiety, depending on the combination of scores that you have. Some adcoms prefer to look at your best scores in each section from multiple tests while other schools consider the average of all of your scores. There are many forums and discussion threads that attempt to identify the schools that rely on each method. However, adcom members may each have a personal preference for how they rank scores and applicants. It’s impossible to predict how any one school will view your scores when there are so many different people involved in the review process. Each committee member will bring their unique perspective and opinion to the discussion. In an article published in 2010 in Academic Medicine on the “Validity of Four Approaches of Using Repeaters’ MCAT Scores in Medical School Admissions to Predict USMLE Step 1 Total Scores,” the authors encourage adcoms to use the average of the students’ scores because they found that these numbers correspond most closely to the scores students will earn on the USMLE Step 1. In April 2015, the new MCAT was introduced. Researchers will need to conduct new studies to examine how students’ scores on the new exam will compare to their performance on Step 1. If you are applying with scores you’ve received before April 2015, it would be safe, based on the research available, to use the average of your scores to help determine how they will impact your application. • The most recent score carried the most weight. • As long as there was an increasing trend in the test scores, previous scores – even if they were low – did not hurt an applicant’s chances of acceptance (as long as all other parts of the application were strong). • When there was high variability within the scores, the highest score for each section was considered and the average was calculated. Overall, it demonstrated determination to see that a student had taken the MCAT more than once – this helped applicants especially when they improved their scores each time they took the exam. Taking the MCAT more than once will not necessarily hurt your application – unless you receive a lower score on the later exam than your previous exam(s). One of my favorite medical students, David, had taken the MCAT six times and completed three or four different postbac programs before he got into medical school. He was – by far – the most popular mentor for our postbac students because he had the best sense of humor and sense of perspective. In taking the MCAT multiple times and improving his score, he demonstrated his determination to succeed. He was able to convince adcoms that there was no other career for him. While I don’t advocate taking the MCAT six times, I do recommend that you learn from each practice exam you take and that you use that knowledge to improve. Create a strategy that will not only help you get into medical school, but one that will help you in medical school and in your career. Are you trying to overcome your multiple/low MCAT scores? Our expert admissions consultants can work with you to craft an effective admissions strategy that will help you get ACCEPTED! Check out our Medical School Admissions Consulting services for more information.